His birth name was Giovanni Battista Tiepolo, but he was also known as Giambattista Tiepolo or simply as Gianbattista, an Italian printmaker and painter who was born in the Republic of Venice on March 5, 1696. He was a prolific artist and had works commissioned from Italy, Spain and Germany, Russia and Sweden. Giambattista Tiepolo had been successful since the start of his career, and when he worked, even the informal oil sketches were worthy of collection. His poetic and luminous frescoes typified the elegance and lightness of the Rococo art movement. According to historians, he was considered as the greatest painter in Europe in the 18th century, a prominent Grand Manner’s first master. His works tickled the imagination by counterchanging the world of myth and ancient history, the sacred legends and the scriptures in a grand or even theatrical manner, departing from convention and celebrating fantasy and caprice. One of his incomparable fresco decorations was the story of Anthony and Cleopatra that decorated the Palazzo Labia in Venice. But his first masterpiece was a series of huge canvases commissioned to decorate the cavernous reception room in Ca’ Dolfin. 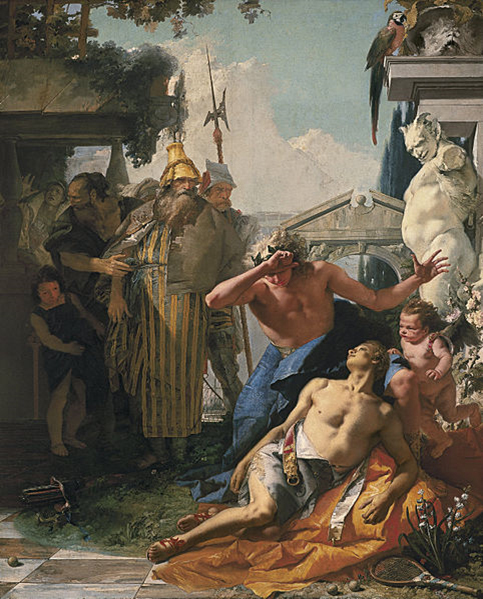 The paintings featured ancient triumphs and battles and gave Tiepolo the chance to employ artifacts, ancient sculptures and exotic costumes as well as violent actions – elements that seemed to extend outside their frames to pervade the room. Since the start of his career, he had been producing great work, but he still had so much to offer. Considered as the greatest among his works were the ceiling frescoes he created in palaces and villas in Italy, at the Residenz in Würzburg, Germany and the Royal Palace in Madrid, Spain, and several Venetian churches. For the ceiling of the residence in Germany of Prince-Bishop Carl Philipp von Greiffenklau, Tiepolo painted a huge ceiling with the continents together with Apollo. The ceiling was over the grand staircase designed by Balthasar Neuman, a top architect in Germany at that time. Tiepolo created the fresco by employing various viewpoints following the progression of people as they climb up the stairs to see the prince-bishop. Tiepolo also did the semi-mythic scenes in the oval reception room, the frescoes beautifully framed by stuccowork, some of the paintings looking like drawn curtains to show some scenes and created 3D images by the clever positioning of a prop, an arm, a hand or a foot. Tiepolo was also valued as a skillful draftsman and his facility was unequaled and he had boundless powers of invention, continuously producing imaginative prints that showed dream-like scenes and at times worrying imagery, with classical monuments, sorcerers and pulcinella (a white-garbed man with a black mask). It was believed that this style might have influenced Spanish painter, Francisco Goya. Tiepolo received art lessons from Gregorio Lazzarini, who was a painter of academic and decorative art. Early on, the young Tiepolo was drawn to chiaroscuro, which gave paintings such dramatic contrasts. This was exhibited in his maiden public work for the Sta. Maria dei Derelitti Church, called “The Sacrifice of Isaac” that was painted in 1716. 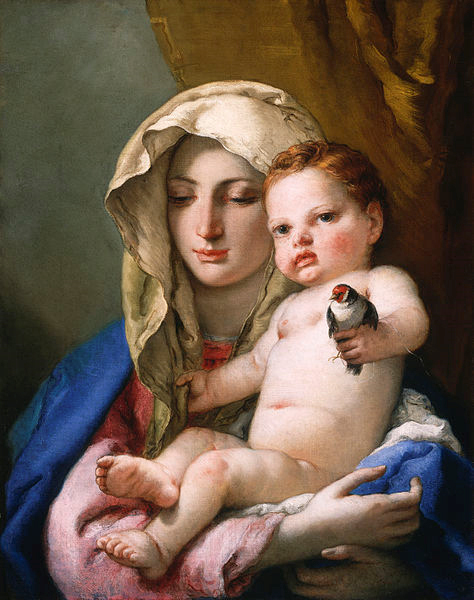 Tiepolo was also influenced by the works of Giovanni Battista Piazzetta, shown in his 1720 creation, “Madonna of Carmelo and the Souls of Purgatory.” Tiepolo’s complex art education, which combined the examinations of the works of foreign contemporary and Venetian artists and works of old masters with his intense artistic sensitivity, gave him a wide range of moods and forms, resulting in a variety of exemplary works even at the initial stages of his career. His works reached maturity when he was 30 years old. By the time he reached age 30, he abandoned chiaroscuro in favor of brighter color although he retained his form. He had often collaborated with Mengozzi Colonna who created beautiful Baroque perspective framings for his frescoes, which, from thereon were created with bolder brush strokes and brighter colors. His fame spread out of Venice and he got commissions from Milan where he decorated Palazzo Archinto, Palazzo Dugnani, Cappella Colleoni and Villa Loschi (Zileri dal Verme). At times, he would not leave Venice and would rather send his work, like the “The Adoration of the Trinity by Pope Clement” that was sent to Nymphenburg and the “The Martyrdom of St. Sebastian” for the church in Diessen, Bavaria. Tipolo had produced a lot of work during his lifetime, which were later forgotten when Baroque and Rococo styles went out of favor. His works were rediscovered when Impressionism was starting to hold firmer ground. Italian and other art critics started to reconstruct his large body of work and scrambled to collate his copious number of brilliant etchings and quick sketches to once again rank him as one of the greatest painters of all times.